OK, it's not slap-bang in the middle of Tokyo, but it's barely an hour from Shinjuku Station by train. 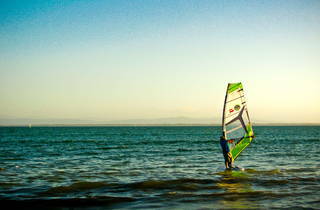 Besides, who wants to windsurf in Tokyo Bay when you've got the beauty of Sagami Bay such a short trip away? Windsurfing Kaya operates out of a small house about 50 metres from Zushi Kaigan beach, and if you were to head straight out of their door, down the road, onto your board, and then plot a course straight across the water, you'd come fairly close to bumping Mt. Fuji straight on the nose. Kaya provides all the equipment you might need to make the plan a reality (though sailing straight across Sagami Bay may take it out of you a bit), as well as friendly schooling for first-timers. They've also got a selection of surfboards and bodyboards for anyone that doesn't do well with the wind behind them. 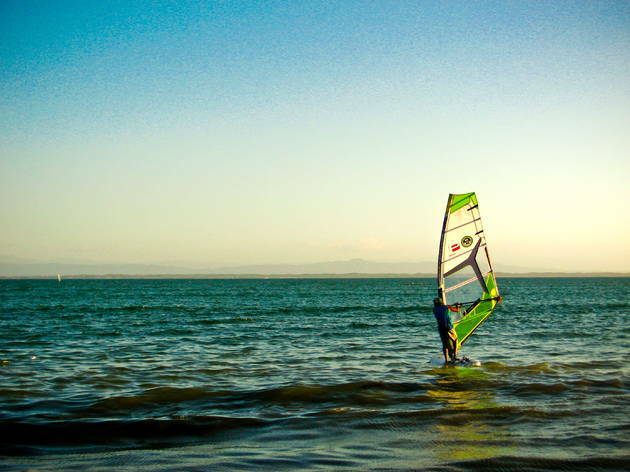 The windsurfing sets (including board and rig set) start from ¥7,350. The price includes five and a half hours' rental, and participants should be on the beach, ready to go, by 9.45am. Let the staff know your required sail size when you reserve. The shop has English speaking staff, though some Japanese speaking ability would be an advantage.